Behind the Bit: What makes your horse's heart go pitter-patter? 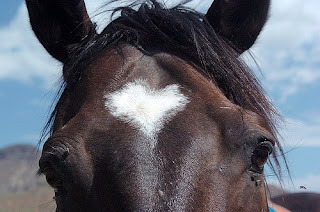 What makes your horse's heart go pitter-patter? If you want to make your horse feel good, and reduce his heart rate significantly (up to 22%), try imitating the common social grooming behavior of horses in a herd. Manual manipulation (scratching, rubbing, massaging) the following areas reduces heart rate (calms) the horse. Note: The normal horse heart rate is around 35-45 beats per minute (bpm) at rest. Twitching paradoxically lowers the heart rate during an unpleasant procedure. A twitched horse's heart rate increases 8%. Horses not twitched during an unpleasant procedure experience a heart rate increase of 22%. The experts say that twitching causes an endorphin release that makes unpleasant experiences less stressful. Many universities study the human/animal bond, and the research results are fascinating. One study showed that horses' heart rate increased when their riders were nervous. How did they arrive at this finding? Mounted riders were told their horse would be blasted with water at some point while they rode. Horse heart rate increase matched the rider's heart rate increase. This indicates riders can communicate nervousness to their horses. Note: No horse/rider combination was ever sprayed! Ellen Gehrke of the Alliant International University claims that a horse's heart rhythms reflect their emotional state and can respond to the emotional state of a nearby human. This was a finding of a pilot study she conducted, where ECG recorders were placed on her and four of her horses. The subjects were monitored during a 24-hour period in which the horses experienced normal conditions and activities such as eating, grooming, being alone, and being ridden and accompanied by Dr. Gehrke. This is something we probably all suspected, but having the research to back up our beliefs is not only gratifying, it's useful knowledge. Apropos fear: A study conducted by the University of Guelph showed that 1/4 of rider injuries are related to a fearful reaction of the horse. Alliant International University Professor Ellen Gehrke and the Institute of HeartMath. Bridgeman, J., Pretty, M. and Tribe, A (2006). Heart rate synchronization of dressage horse and rider during warm up period for a competition dressage test. Interesting findings about lowering your horse's heart rate. I've been doing quite a bit of accupressure/massage on my horses for several months. I've found my horses hold tension in their polls, over their withers, and in their croup/hip area. During the massage and after they release they get this dreamy relaxed expression and their eyes soften. Even my non-horsey husband noticed how much it calms them. Those are all interesting facts. I always thought that grooming lowered their heart rates and made them calmer, same goes for the nervous rider vs. the calm rider. Good post. I'm tagging this article as a favorite. My horse carries tension in his neck and over to his croup. This reminds me that I can help him relax during our grooming sessions.